(1 Customer Reviews) | Write Review 12 issues per year Love quilting and patchwork? This fresh, new, beautifully designed magazine is bursting with nearly 100 pages of pretty projects and ideas to inspire you! Just like our readers, we’re addicted to fabric, and every issue will be full of makes big and small, from quilts to cuddly toys, fashion accessories to furniture updates – whether you like to choose from the latest collections, or are looking for ways to use some of that much-loved stash. 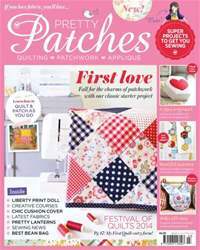 The seize-the-day-and-get-sewing New Year issue of Pretty Patches has arrived and we've squeezed plenty of super projects in for the start of 2014, including a chic cushion cover, a Liberty print doll, pretty lanterns, beautiful bedcovers and a Cheshire Cat hand warmer. You'll also learn how to quilt-as-you-go or release your inner artist with a free motion quilting workshop and much more. Love quilting and patchwork? This fresh, new, beautifully designed magazine is bursting with nearly 100 pages of pretty projects and ideas to inspire you! Just like our readers, we’re addicted to fabric, and every issue will be full of makes big and small, from quilts to cuddly toys, fashion accessories to furniture updates – whether you like to choose from the latest collections, or are looking for ways to use some of that much-loved stash. 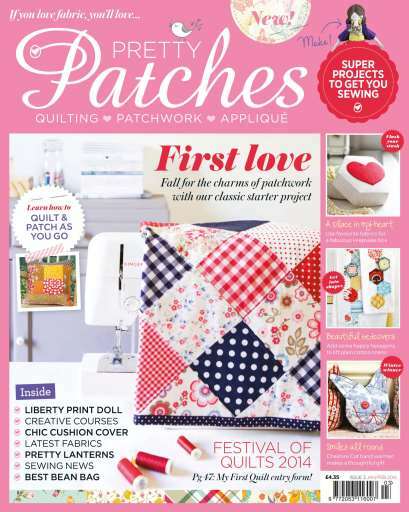 You'll receive 12 issues during a 1 year Pretty Patches Magazine magazine subscription. Lots of beautiful ideas in this issue. I bought it on the recommendation of a friend and I wasn't disappointed. Loved the Kindle cover and the little girl's skirt ideas! You'll receive 12 issues during a 1 year Pretty Patches Magazine magazine print subscription.